Join VisArts instructor Meg Von Der Linden to explore the world of Amaco mid-range glazes. Mid-range glazes can provide an exciting dimension to finished work, but figuriong out application and combinations can be an expensive process. Trial and error is one way of figuring out glaze combos, but step-by step testing combined with Meg’s knowledge after years of practise using mid-range glazes can totally move your glaze game to a new and much more satisfying level. No prior experience is needed. Please come with bisqued pieces and and mid-range glazes that you would like to try. 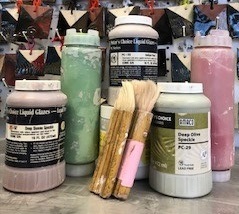 Visarts will have an assortment of mid-range glazes to use on test tiles (but not for full glaze application). No clay (except for test tiles) are provided with this class and no shelf space.